San Jose, Calif.-based Cisco Systems Inc. has released a new report that it’s hoping will serve as a call to action for complacent companies that believe they’re harnessing digital technology to the best of their abilities. 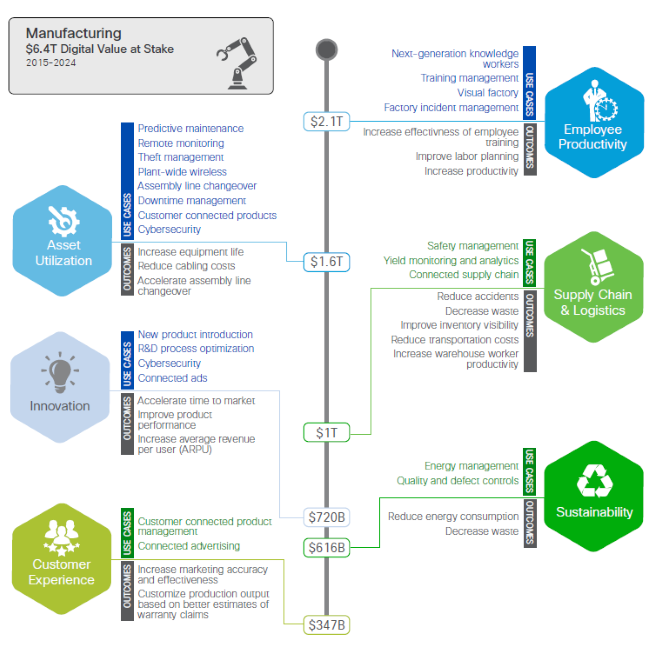 The report, titled “Where to Begin Your Journey to Digital Value in the Private Sector,” analysed more than 350 instances of digital technology use in 16 industries, focusing on six (manufacturing, financial services, retail, service provider, healthcare, and oil & gas) that are expected to account for nearly three-quarters of the global private sector’s value in the coming decade (below), and concluded that collectively, the private sector effectively used only 20 per cent of what Cisco called its “Digital Value at Stake” in 2015. Despite witnessing firsthand the effects digital breakthroughs have had on the technology, media & entertainment, retail, and financial services industries, to name four, far too many companies and their leaders are failing to respond to digital disruption in their respective fields, the report says. 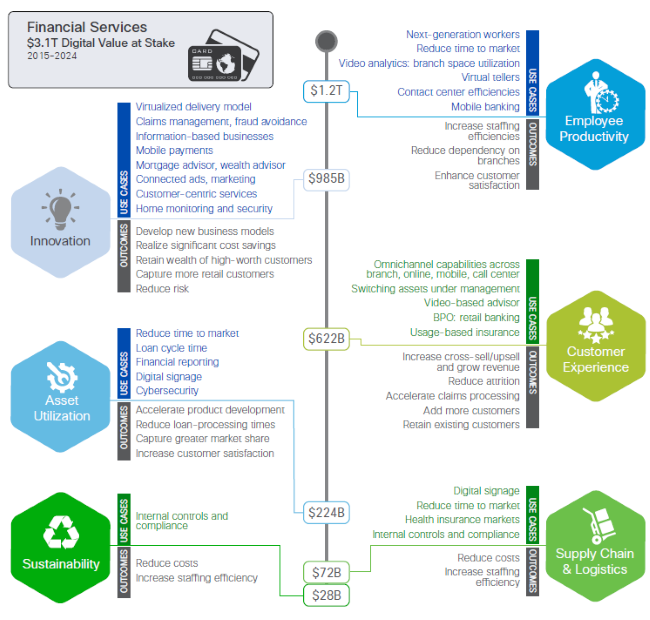 The report, which was published on Jan. 13, represents a continuation of Cisco’s ongoing efforts to calculate the private sector’s digital value, which it began in 2012. 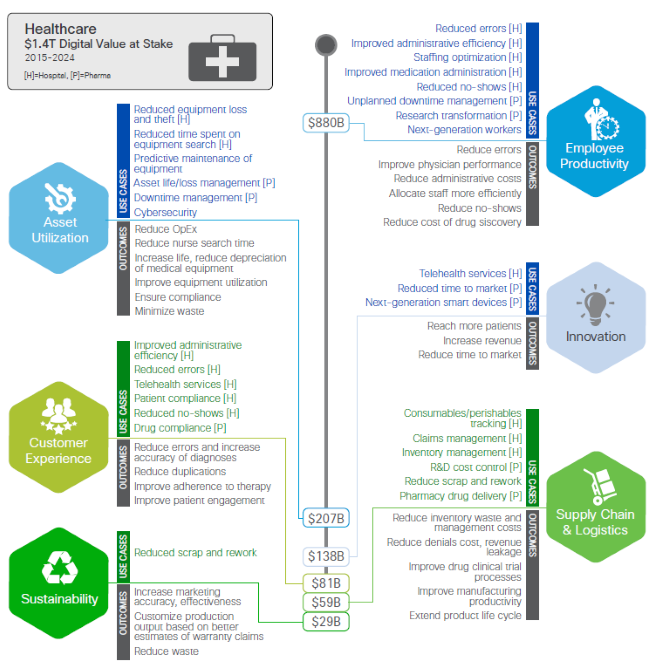 In the company’s initial study, Cisco estimated that $14.4 trillion USD would be at stake across the private sector between 2013 and 2022 (breakdown by region below), basing its calculations on both new sources of income that would be created by digital innovation and investments, and on the value that would shift between companies and industries as certain players harnessed those innovations more effectively than others. 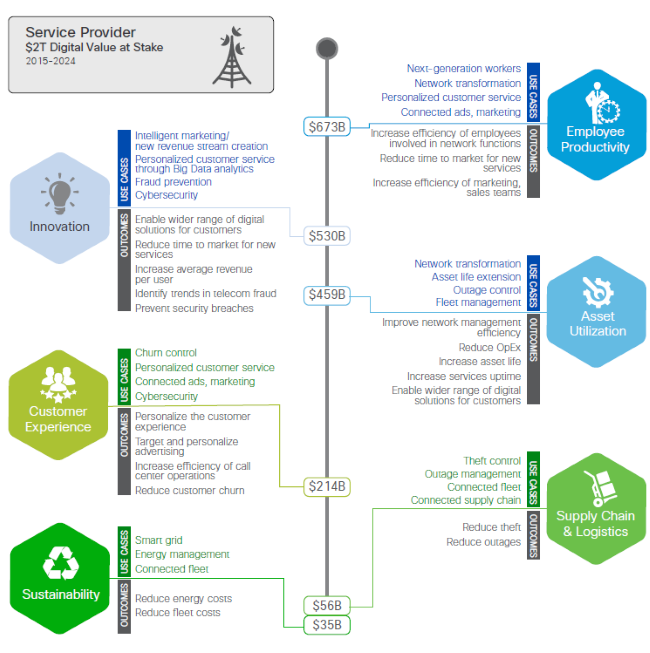 In analyzing its newest data, Cisco concluded that the industries reaping the greatest value from their digital efforts shared two characteristics: they were IT-intensive, both in terms of the services and products they deliver and how they deliver them, with Cisco noting that digital leaders such as Apple, Uber, and Tesla received especially high marks thanks to their willingness to create new business models; and they had effectively integrated the IT and operational technology (OT) components of their companies. Effective cybersecurity strategies play a role too, and could potentially fuel an estimated $5.3 trillion USD in private sector value over the next decade, with 68 per cent of that value tied to firms’ ability to integrate cybersecurity into their operations, the report says. 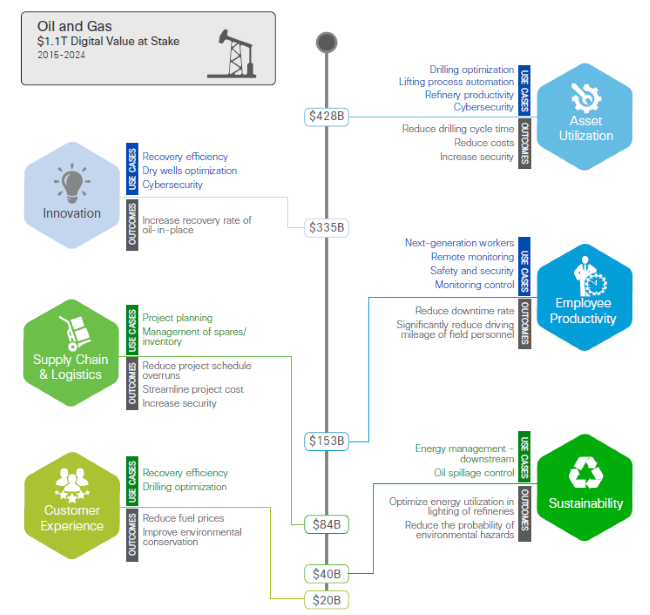 In particular the mining and utilities industries lagged in Cisco’s study, utilizing only 10 and 14 per cent of their respective digital values, according to the report. The oil & gas and manufacturing industries fared better, utilizing 27 per cent and 24 per cent, respectively, thanks to their relatively high convergence of IT and OT. However, even the industries that fared best in the study are utilizing far fewer of their digital capabilities than they could be in Cisco’s eyes. The financial services industry fared best, realizing 29 per cent ($236 billion USD) of its digital value in 2015, while service providers reached 21 per cent, according to the report. 3. Develop hyperawareness of the impacts new digital technologies are having on your company’s industry, making it the core of your decision-making, and learn to execute them quickly. 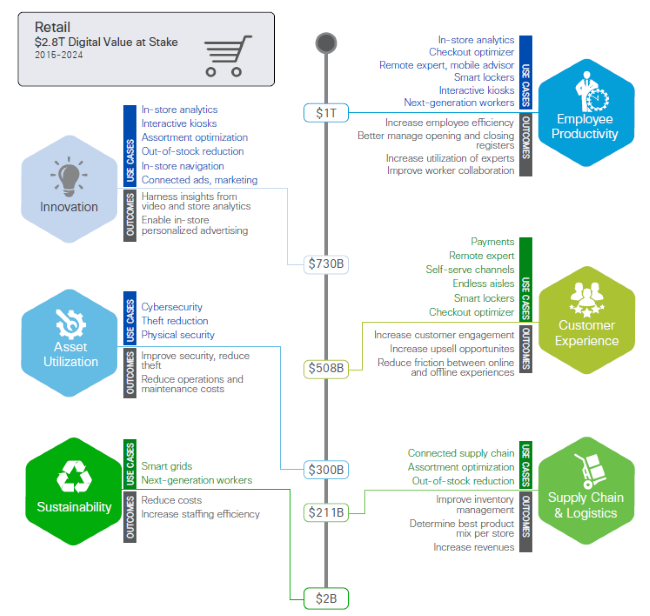 Also, if your company happens to be part of one of the six industries broken down in Cisco’s study you’re in luck, as the report’s authors created a series of infographics outlining the key digital value drivers, examples of their use, and business outcomes for all six, which you can read below.